^ Kelly, Andy. Arsenal’s First Game – The Facts Finally Revealed « The History of Arsenal. www.blog.woolwicharsenal.co.uk. AISA Arsenal History Society. 2013-04-21 [2016-06-07]. （原始内容存档于2013-04-26） （英语）. ^ The real capacity of Emirates Stadium. www.arsenal.com. The Arsenal Football Club plc. [2016-07-28] （英语）. ^ English Premier League : Full All Time Table. statto.com. [2016-01-26]. （原始内容存档于2016-02-10） （英语）. ^ Ross, James; Heneghan, Michael; Orford, Stuart; Culliton, Eoin. English Clubs Divisional Movements 1888–2016. www.rsssf.com. Rec.Sport.Soccer Statistics Foundation. 2016-06-23 [2016-08-05]. （原始内容存档于2016-08-05） （英语）. ^ Hodgson, Guy. Football: How consistency and caution made Arsenal England's greatest. The Independent (London). 1999-12-17 [2016-05-13]. （原始内容存档于2016-03-03） （英语）. ^ Herbert Chapman. National Football Museum. [2016-03-20] （英语）. ^ 7.0 7.1 Deloitte Football Money League (PDF). Deloitte. [2016-01-21]. ^ Ozanian, Mike. The Business of Soccer. Forbes. [2018-06-27] （英语）. ^ HOW ARSENAL’S NAME CHANGED – DIAL SQUARE. The Arsenal History. 2014-01-10 [2016-07-24]. （原始内容存档于2015-08-04） （英语）. ^ Kelly, Andy; Andrews, Mark. How Arsenal’s Name Changed – Royal Arsenal. The Arsenal History. 2014-01-13 [2016-06-11]. （原始内容存档于2015-05-01） （英语）. ^ Kelly, Andy. 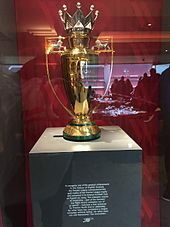 122 years ago today – Arsenal’s first Silverware « The History of Arsenal. www.blog.woolwicharsenal.co.uk. 2012-03-01 [2016-06-11]. （原始内容存档于2016-03-29） （英语）. ^ Kelly, Andy. 121 Years ago today – Royal Arsenal’s last trophy « The History of Arsenal. www.blog.woolwicharsenal.co.uk. 2012-03-07 [2016-06-11]. （原始内容存档于2016-06-05） （英语）. ^ 18.0 18.1 18.2 18.3 18.4 18.5 18.6 A Conservation Plan for Highbury Stadium, London (PDF). Islington Council. 2005-02-14 [2012-02-04]. （原始内容 (PDF)存档于2012-02-04） （英语）. ^ Page, Simon. Herbert Chapman: The First Great Manager. Birmingham: Heroes Publishing. 2006-10-18: 139. ISBN 978-0-9543884-5-4 （英语）. ^ Barclay, Patrick. Arsenal: The Five-Year Plan. The Life and Times of Herbert Chapman: The Story of One of Football's Most Influential Figures. Orion. 2014-01-09. ISBN 978-0-297-86851-4 （英语）. ^ Kelly, Graham. Terrace Heroes: The Life and Times of the 1930s Professional Footballer. Psychology Press. 2005: 26, 81–83. ISBN 978-0-7146-5359-4 （英语）. ^ Brown, Tony. Champions all! (PDF). 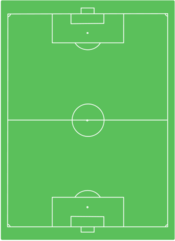 Nottingham: SoccerData. 2007: 6–7. ISBN 1-905891-02-4 （英语）. ^ Kelly, Andy. Arsenal underground station renamed earlier than believed. 2015-10-31 [2016-06-26]. （原始内容存档于2016-06-26） （英语）. ^ Bull, John. It's Arsenal Round Here: How Herbert Chapman Got His Station. 2015-12-11 [2016-06-26]. （原始内容存档于2016-02-23） （英语）. ^ Warrior, Yogi's. The Death Of Herbert Chapman Of Arsenal On This Day, 6th January 1934. Arsenal On This Day: A Prestigious History Of Football. 2013-01-06 [2016-07-01]. （原始内容存档于2016-07-01） （英语）. ^ Rippon, Anton. Chapter Nine. Gas Masks for Goal Posts: Football in Britain During the Second World War. The History Press. 2011-10-21. ISBN 978-0-7524-7188-4 （英语）. ^ Post-War Arsenal – Overview. Arsenal. [2009-11-27] （英语）. ^ Brown. Champions all!. 2007: 7 （英语）. ^ Warrior, Yogi's. Bertie Mee Appointed Acting Manager Of Arsenaln This Day, 20th June 1966. Arsenal On This Day: A Prestigious History Of Football. 2012-06-20 [2016-07-07]. （原始内容存档于2016-07-07） （英语）. ^ 36.0 36.1 Ponting, Ivan. Bertie Mee. The Independent. 2001-10-23 [2016-07-04]. （原始内容存档于2016-03-06） （英语）. ^ Tossell, David; Wilson, Bob. Seventy-One Guns: The Year of the First Arsenal Double. Random House. 2012-04-13: 105. ISBN 978-1-78057-473-8 （英语）. ^ Media Group, Arsenal. The Managers. www.arsenal.com. The Arsenal Football Club plc. 2008-06-30 [2016-07-05]. （原始内容存档于2016-04-05） （英语）. ^ Kelly, Andy. Arsenal’s Complete FA Cup Final Record. The Arsenal History. 2015-05-27 [2016-07-04]. （原始内容存档于2016-04-18） （英语）. ^ Smyth, Rob. Football: Joy of Six: Rob Smyth picks the greatest defences. The Guardian. 2009-05-08 [2016-07-07]. （原始内容存档于2016-03-10） （英语）. ^ Clarke, Andy. Top Ten: Title Run-ins. Sky Sports. 2009-03-26 [2009-12-07] （英语）. ^ * Why the FA banned George Graham. The Independent. 1995-11-10 [2016-07-15]. （原始内容存档于2011-12-10） （英语）. Bower, Tom. Broken Dreams: Vanity, Greed and the Souring of British Football. Simon & Schuster. 2003. ISBN 978-0-7434-4033-2 （英语）. ^ Moore, Glenn. Rioch at odds with the system. The Independent (London). 1996-08-13 [2009-10-23] （英语）. ^ Palmer, Myles. The Professor: Arsène Wenger. Random House. 2011-03-31: ix, 21, 90, 123, 148. ISBN 978-0-7535-4661-1 （英语）. ^ Ronay, Barney. Chapter 30 – The Enlightenment. The Manager: The absurd ascent of the most important man in football. Little, Brown Book Group. 2010-08-05. ISBN 978-0-7481-1770-3 （英语）. The menu for World Cup success. BBC. 1998-05-23 [2016-07-11] （英语）. Anthony, Strudwick. Part 1: Foundations of Soccer Science. Soccer Science. Human Kinetics. 2016-06-07: 3–36. ISBN 978-1-4504-9679-7 （英语）. ^ Fraser, Andrew. Arsenal run ends at 49. BBC Sport. 2004-10-25 [2008-08-27] （英语）. ^ Arsenal. Football Club History Database. Richard Rundle. [2009-10-23]. （原始内容存档于2009-11-06） （英语）. ^ Aizlewood, John. Farewell Bergkamp, hello future. The Times (UK). 2006-07-23 [2009-10-23] （英语）. ^ Hytner, David. Arséne Wenger savours FA Cup win over Hull as Arsenal end drought. The Guardian (UK). 2014-05-18 [2014-05-21] （英语）. ^ Ronay, Barney. Arsenal cruise to Community Shield win over weakened Manchester City. The Guardian (UK). 2014-08-10 [2014-11-01] （英语）. ^ Taylor, Daniel. Alexis Sánchez inspires Arsenal to win over Aston Villa. The Guardian (UK). 2015-05-30 [2015-05-30] （英语）. ^ Cryer, Andy. Arsenal 1–0 Chelsea. BBC (UK). 2015-08-02 [2015-08-04] （英语）. ^ McNulty, Phil. Arsenal beat 10-man Chelsea to a win record 13th FA Cup. BBC.com/football. BBC. [2017-05-27] （英语）. ^ 谢谢你，阿尔塞纳 - 阿森纳中国官网. cn.arsenal.com. [2018-04-20] （中文）. ^ Unai Emery announced as new Arsenal head coach. Sky Sports. [2018-05-25] （英语）. ^ 56.0 56.1 56.2 The Crest. Arsenal F.C. [2008-08-11]. （原始内容存档于2008-08-12）. ^ The Art Deco crest. Arsenal F.C. [2010-01-24]. （原始内容存档于2009-10-30）. 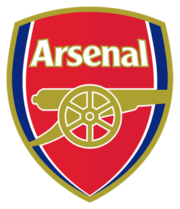 ^ The Arsenal shirt badge. Arsenal F.C. [2010-01-24]. （原始内容存档于2009-10-30）. ^ Free, Dominic. Arsenal v. Reed in the Court of Appeal. Michael Simkins LLP. 2003 [2008-08-11]. （原始内容存档于2008-04-08）. ^ Arsenal go for a makeover. BBC Sport. 2004-02-01 [2008-08-11]. ^ Crestfallen (PDF). Arsenal Independent Supporters' Association. [2008-08-11]. （原始内容 (PDF)存档于2006-11-08）. ^ 125 Years in the Making: Anniversary Crest. Arsenal.com. 2011-05-01 [2011-06-09] （英语）. ^ 64.0 64.1 Arsenal. Historical Football Kits. [2006-12-08]. ^ 65.0 65.1 65.2 Arsenal Kit Design. Arsenal.com. [2008-11-08]. ^ Hibernian. Historical Football Kits. [2008-08-11]. ^ Rui Matos Pereira. O segredo do sucesso do Braga. UEFA.com. 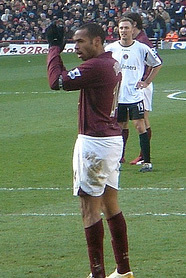 2005-10-21 [2008-09-02]. （原始内容存档于2008-12-21） （葡萄牙语）. ^ 80s Shirts. Arsenal Shirts. [2008-08-11]. （原始内容存档于2008-12-21）. ^ Club Charter. Arsenal.com. [2008-08-11]. ^ 2000s Shirts. Arsenal Shirts. [2008-08-11]. （原始内容存档于2008-12-21）. ^ New away kit 2007/08. Arsenal.com. [2008-08-11]. （原始内容存档于2009-02-07）. ^ （英文） Highbury. Arsenal.com. [2008-08-11]. （原始内容存档于2008-01-11）. ^ （英文） Arsenal get Wembley go-ahead. BBC Sport. 1998-07-24 [2008-08-11]. ^ （英文） Arsenal consider leaving hallowed marble halls. The Independent. 1997-08-18 [2008-08-19]. ^ （英文） Arsenal unveil new stadium plans. BBC Sport. 2000-11-07 [2008-08-11]. ^ （英文） Bergkamp given rousing farewell. BBC Sport. 2006-07-22 [2007-08-23]. 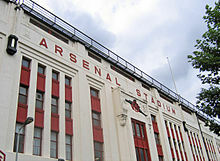 ^ （英文） Arsenal name new ground. BBC Sport. 2004-10-05 [2008-08-11]. ^ （英文） Dawes, Brian. The 'E' Word. Arsenal World. Footymad. 2006 [2008-08-11]. （原始内容存档于2006-10-08）. ^ （英文） Riach, James. Arsenal's new Emirates sponsorship deal to fund transfers and salaries. The Guardian (London). 2012-11-23 [2012-12-17]. ^ （英文） Training ground. Dailymail. 2015 [2015-02-23]. ^ （英文） Training ground. Arsenal FC official website. 2015 [2015-03-03]. ^ US businessman Stan Kroenke agrees bid to buy Arsenal. BBC Sport. 2011-04-11 [2011-04-12] （英语）.